Never Heard of Toy Soldiers? Read our Review of the Game Here. What happens when your brother decides that your toy soldier army is too strong and you simply can’t be beat? He cheats of course, and grabs tons of unrelated toys to attempt to take you down. Of course, since you are so awesome you easily beat him with your normal toy soldiers and never let him live down the moment. 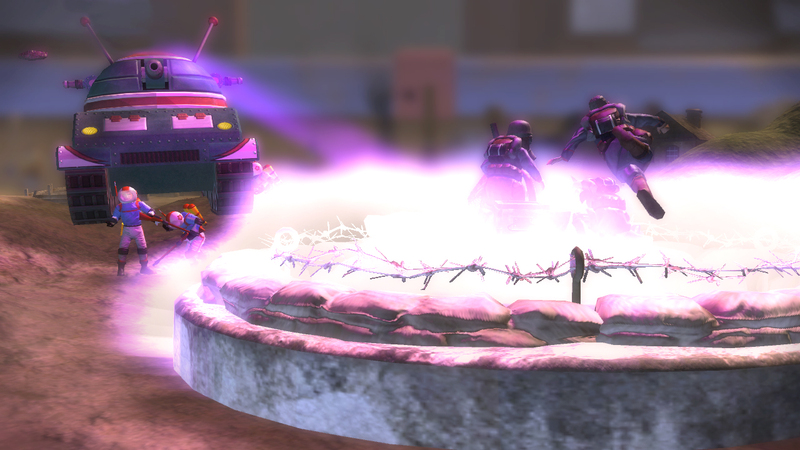 The new Toy Soldiers: Invasion DLC is just like this scenario. In this case the British is your brother, and they have discovered a plethora of new toys to take your soldiers out with. 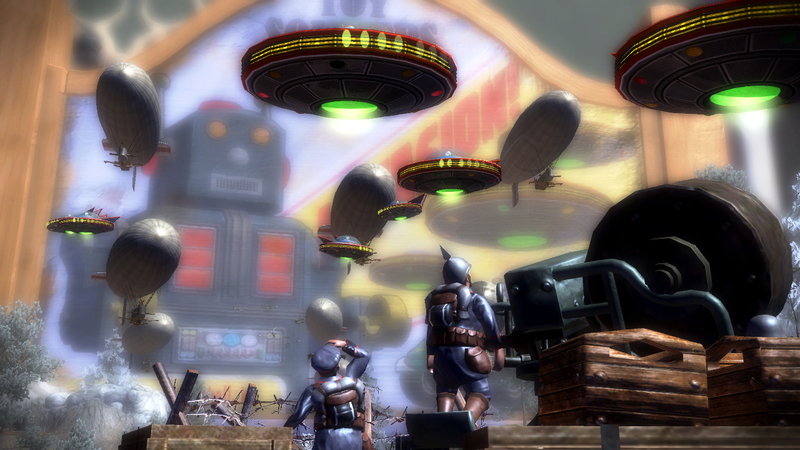 Play as the German army as you attempt to stop this invasion of “alien” toys and beat the British down into utter humiliation. The gameplay is exactly like it is in the rest of the game. This isn’t the Toy Soldiers review, this is a review on the DLC. If you have never played the game, read the review and download the demo. Both links are available at the top. The Invasion DLC lets you play as the German army against a British army who has found new technology. There are 3 levels with multiple waves of enemies on them. Since this is an Invasion, there is new Invasion art, new “Alien” soldiers, special in game “Alien” vehicles, and a whole bunch of other stuff that doesn’t fit in a WWII theme. There are also two new maps that come with the DLC enabling for bigger battles online in multiplayer and then there is also a survival map to test your skills on. The new boss is “50 tons of giant tin-toy robot death”. The thing is huge and menacing, just like all the bosses found in the game. It may require a few attempts and a lot of strategic unit placing in order to destroy it on harder settings. The 3 level Invasion Campaign is short and sweet. 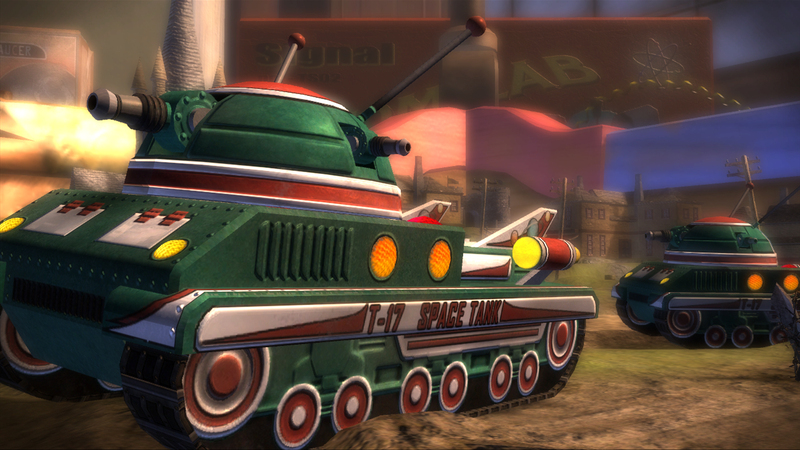 If you are a fan of Toy Soldiers you will enjoy the new levels to plan on as well as the new Golden Rockets to find. There are 3 new achievements, and they follow suit with the achievements from the first DLC and the achievement types in the actual game. This time around, the golden blocks that are usually located in each level, have been replaced with golden rockets. The rest, is exactly the same; beat a boss, and destroy stuff. The Rockets are definitely the hardest part, the other two will just come from playing. Rocketman – 15 – Find all the golden rockets in Invasion!single player levels. Mr. Roboto – 25 – Defeat the dreaded RoboBob boss. Foo Fighter – 10 – Shoot down 40 UFO’s in one level with the new P51 Mustang. There is plenty to do in this DLC and a bunch of extras to play around with. Along with a new mini-campaign, new opponents, new survival map, new achievements, and new multiplayer maps; there is tons to do. While this bit of DLC isn’t exactly historically accurate, as the rest of the game attempted to be; it sure is a lot of fun to fly P51 Mustang WWII fighter plane or drive the T-17 Space Tank as you defend against the enemy units. Like the previous DLC, this DLC simply adds more to play in the Toy Soldiers game and I’m sure anyone still playing this game is going to love the new scenery and new enemies that you encounter in this DLC.